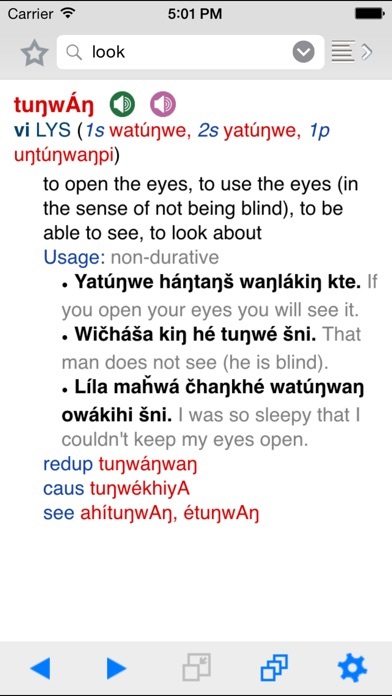 The New Lakota Dictionary (NLD) Mobile App is the best way to look up Lakota words, hear pronunciation, and view thousands of example sentences while on the go. It’s the ultimate electronic Lakota learning and reference tool. 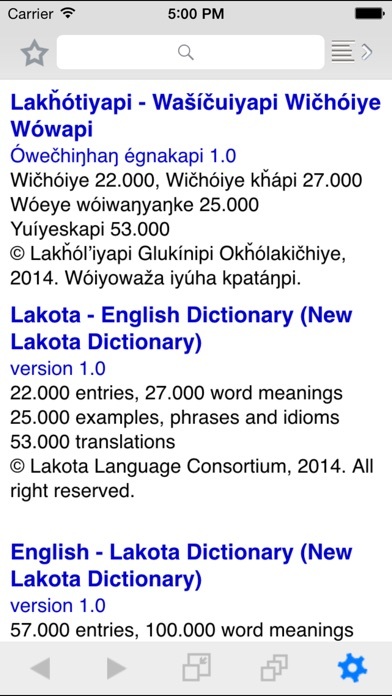 •	27,000 entries •	53,000 sentences •	Male and female voices for audio •	Consistent phonemic spelling – Standard Lakota Orthography •	Superior cross-referencing capabilities •	Faster and more responsive than online versions •	Works offline, without active data connection •	Built-In lemmatizer searches for conjugated verbs and word forms •	Over 400 native speakers involved in its development and review •	Regularly updated •	Accurate and reliable •	Fun to use and explore •	An excellent self-study investment The lemmatizer is one of the biggest advantages of the app when compared to the printed version of the NLD. 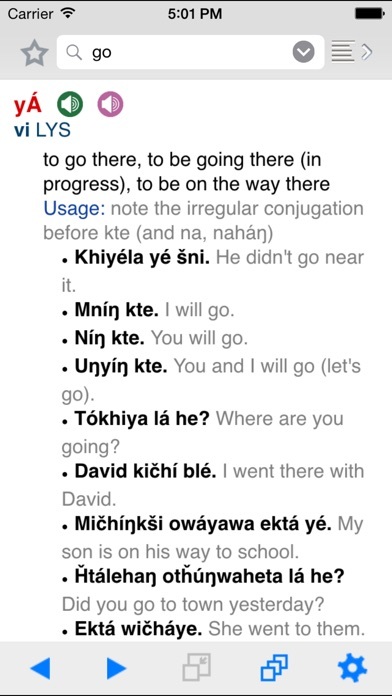 Lakota is a highly agglutinating language. Affixes are added to words all the time, so unless you know the stem of the word with affixes, you won’t be able to find it in the dictionary. The app does that for you. If you type in e.g. 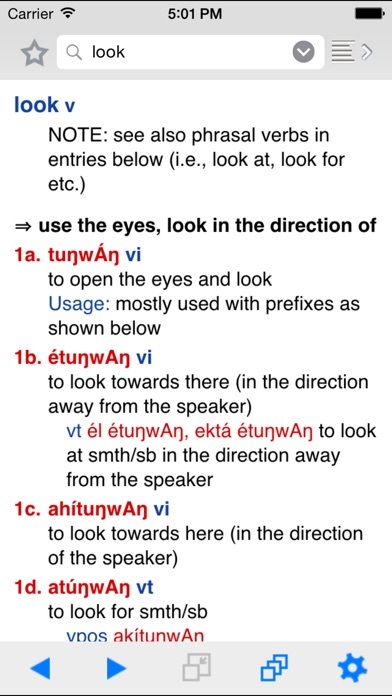 waŋwíčhablake the app will show you the entry waŋyáŋkA. The application is confusing to understand. App is very frustrating to use. Needs to be updated. I’d rather take the time to search on kiwichoiye than refer to the dictionary for the newly added words. The app won’t allow me to view the word I’m searching for and instead leads me to a different word. I cannot tap on any of the datives for further conjugation and the words with male and female pronunciation say entirely different words. Disappointed in the neglect of some simple app structure/development. 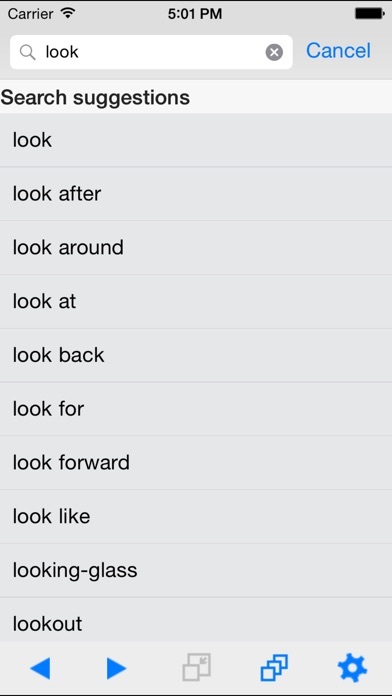 It's great to have this mobile dictionary! Quickest and easiest way to look up new or confusing words. Lost a star because navigation is not great easy to lose your place and have to re search the word. Nice resource but the favorites button does not work so I am unable to save anything. Also it is not easy to search and come back to where you were? Some examples just return an error message without explanation? Not user friendly at all. After downloading the app, it will open, but no content loads. Unable to find a way to contact the developer. Hope this is resolved soon.